Concrete Producer Frank Bryan Inc.
Pittsburgh developer and builder, Ernie Sota, has been constructing environmentally friendly buildings for three decades. He’s been LEED (Leadership in Energy and Environmental Design) accredited by the U.S. Green Building Council for five years and serves on the board of Pittsburgh’s Green Building Alliance. A few years ago, his company, Sota Construction Services, built the Carson Retirement Residence/Sarah Street Apartments with insulated concrete forms (ICFS), choosing them for their insulation value and sound blocking qualities—both green attributes. So when Sota was ready to build Windom Hill Place, luxury townhomes on Pittsburgh’s South Side, he decided to use ICFs once again. “I was interested in ICFs for several reasons,” says Sota. “I thought they provided a good marriage of structural response to the hillside conditions and thermal mass. They also provide a high level of quality for the building,” he says. 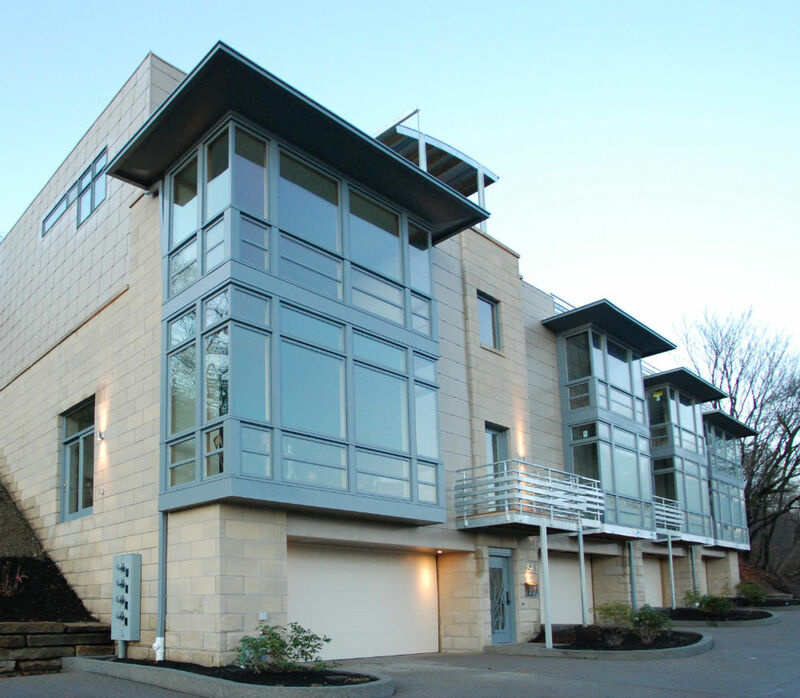 Perched on Pittsburgh’s South Side Slopes, above the Monongahela River, Windom Hill Place was designed by architect John Martine of Strada LLC to evoke the hillside homes of European cities like Budapest and Prague. The first phase of the project, completed in November 2006, consisted of one structure with four units. Sota plans to build another five-unit building on the site once those first units are sold. Each 2,800-sq. ft. unit includes a ground level garage, a living room and kitchen on the first floor, a second floor level with two bedrooms and an expanded master suite on the top. The interior of each unit is clear span, so the people who buy the homes will have the flexibility to configure the units to meet their specific needs. The townhomes incorporate many green features including cork and bamboo floors, EnergyStar appliances and HVAC system, low VOC paints and plenty of natural lighting. The floor-to-ceiling windows provide spectacular views of the city below. A balcony on the fourth floor, made from structural concrete, can support a hot tub, a small garden or even trees if the homeowners decide that they want to add some green features to that living space. The terrain made construction difficult and was one reason why the builder decided to use ICFs. Canadian-based Arxx supplied the ICF forms, which were manufactured in the company’s Pennsylvania plant. Frank Bryan Inc. of Pittsburgh supplied the concrete. The project required 320 cubic yards of concrete, much of it with a fly ash component that made it a greener product. The thickness of the concrete walls varies by floor. The first two stories in the rear of the building have 10-inch thick concrete walls plus two and a half inches of foam on each side, for a total thickness of 15 inches. Although site preparation was a challenge, most of the ICF work was not. Laying out the four-foot-long blocks required only five or six workers—one experienced lead person and the remaining carpenters. It only took about two weeks to get the building up. Due to the building design (large window openings) and its location, additional steel reinforcement was needed for support. That steel reinforcing required some manipulation of the ICFs and included hand forming a 24-inch exterior concrete beam around the building. Locating the beam on the inside of the building was not an option because the space in the rear was needed for an elevator shaft. Once the ICFs for an entire floor were ready, it took about six hours to fill the forms with a standard 4,000 psi wall mix concrete. On the exterior, crews covered the first two layers of ICFs with split face block (cast stone with recycled content) and the top two with recycled metal panels. Drywall covers all interior walls. The use of ICFs in the construction of Windom Hill Place will offer a particular appeal for people who believe that green building is important - and who want to save money in energy costs over the long term. The ICFs will help keep the energy bills low at Windom Hill Place. In combination with the special double-paned windows and a high-tech energy recovery ventilation system that Sota has used, the thick, insulating ICF walls should bring homeowners a 60 percent savings over what they would pay in a comparably sized, conventionally built home.